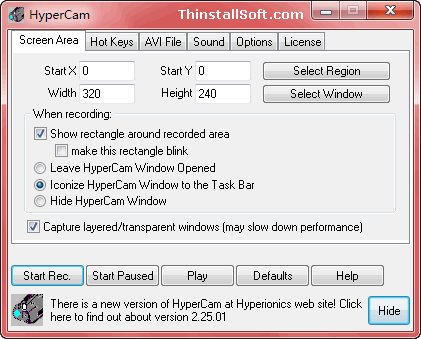 HyperCam is a freeware screen recorder. It can capture and record screen actions and save it to AVI (Audio-Video Interleaved) movie file. Also HyperCam could record sound from your microphone. HyperCam is the useful screencasting software for creating software presentations, tutorial, demos, demonstrations etc. In addition, HyperCam also supports text annotations, sound, and screen notes (great for creating automated software demos and software training!). You can also select Frame rate and compression quality prior to recording your movie. For more powerful screencasting program, you could try Camtasia Studio Portable. This entry was posted in Audio & Video and tagged hypercam, screen recorder, screencast. Bookmark the permalink.